The entire season of Netflix's Marvel's Daredevil is out, but there's too much Manliness without Fearness to deal with at once! When did that costume first appear? Where did the hazardous materials come from? So many questions! Let's tackle the secrets of Daredevil's first episode! For the record, the art up top is by Marvel Chief Creative Officer Joe Quesada, who got the job as EiC after his surprise-hit run as artist of Daredevil for the nascent Marvel Knights comics imprint. The series was such a hit (after years of flagging Daredevil sales) that Quesada was given a shot at running the entire company a few years later, and is still one of the Marvel big wigs to this day. Also, let's set some ground rules for this Secrets of SHIELD series of articles about Netflix's Daredevil. This show is getting the same amount of coverage Agents of SHIELD and other shows have, but unlike the others, this series all came out at once. I have other (actual paying) jobs, so in the interest of time I'll be posting one of these each week for each subsequent episode. The conceit here is that I'll only be covering stuff actually mentioned in that episode, so if a character isn't named until later or an event doesn't happen until later, I'll wait till the relevant time to mention it. As always, whenever something or someone is named on screen for the first time, the name will be in bold. Quickie Review: Damn good start. The first scene with the actual incident was a bit bland (though necessary), but after that it picked up speed fast and never slowed down. No punches were pulled, to coin a pun. The Spoiler-Light Recap: Introducing the cast and the main conflict. Matt and his friends try to eek out a living in Hell's Kitchen while Kinpin and his friends try to destroy Hell's Kitchen while Daredevil (who isn't called Daredevil) tries to save Hell's Kitchen from the bad guys. The series opens chronologically with the aftermath of the fateful crash that took nine-year-old Matt Murdock's eyesight and gave him so much more. The "hazardous materials" barrels don't seem to be identified by company, but in the comics it was Ajax Atomic Laboratories. Of course, true comic geeks know the group behind it all was TCRI, a group of aliens that unintentionally mutated people (and turtles) with their ooze. And really geeky Marvel fans might know the time-traveling, size-changing hero Bug caused the accident itself (of course, he also caused half of the Silver Age origins too). Jump ahead 20-some years (give or take), and Matt is giving confession at church. It's important to note just how Catholic Daredevil is. Matt attributes this to his grandmother, who said the Murdock boys "got the Devil in 'em." Viewers also learn about Matt's dad, Battlin' Jack Murdock. In the show he had a 24-31 record, which is pretty decent but not great, but he never lost by knockout because he could take a beating, and occasionally he'd snap and let the Devil inside of him out, scaring his opponents. We'll get more on Jack Murdock later on, but let's address that inner anger. Recently during the Original Sin event, it was heavily implied that Battlin' Jack unleashed his anger on his family. Spoiler alert: things weren't what they seemed, and Jack was still on the side of the angels. The first time we see Daredevil in action he's busting up a human trafficking and kidnapping situation orchestrated by the Russian mob, involving local freelance crook Turk Barrett (the first guy to get Daredevil's fist in his face). Seems appropriate, since Turk is the go-to criminal Daredevil beats up whenever he needs information (or just wants to blow off some steam). Turk of the comics has been depicted in different ways over the years: sometimes he's a heartless crook and sometimes an ex-con that cares. Even his skin was inconsistent - sometimes he appeared black, other times white – as it turns out Turk has a form of vitiligo . The one thing that has been consistent over the years? If there is a window, Turk will be thrown through it. ... and 1993's Daredevil: The Man Without Fear mini-series (but more on that comic later). The next day Matt's partner Foggy Nelson is busy bribing cop Brett Mahoney with a bag of cigars for Brett's mom Bess. Brett was part of the short-lived 2007 run of Marvel Comics Presents, in which he and his partner uncovered a strange conspiracy implicating the cosmic entity the Watcher in a New York murder. Afterwards, Matt and Foggy meet with Susan Harris of Midtown Property Solutions, signing on for an office formerly used by Van Lunt Real Estate, recently vacant following "the incident." We'll touch on who "Van Lunt" is when that becomes relevant in the second half of the season, but what's important is that this is the first of many references the series makes to the Battle of New York, aka Marvel's The Avengers, you know, that big Marvel movie from a few years ago. It seems the Loki-led Chitauri invasion that destroyed much of New York City left Hell's Kitchen in shambles. Although it's rebuilt now, nefarious forces have moved into to kick the wounded borough while it's down. Karen Page is introduced ominously over the murdered body of Daniel Fisher, both employees of Union Allied Construction, Karen was a secretary, Daniel was in legal. Karen is so pale, admittedly due to the shock of her circumstance as much as anything else, you'd almost mistake her for a vampire. Almost. Karen noticed suspicious numbers in the company pension fund, but her boss Mr. McClintock laughed it off. She invited Daniel to the Three Rose Bar so he could look into it, but the next the she knew she was covered in blood. Thankfully, Nelson and Murdock learn about her from Brett and come to her (legal) rescue. Karen was a part of Matt's life since 1963's Daredevil #1, but things didn't work out too well for her over the years. Foggy considers taking a deal from Feinstein at the DA's office, but Matt just knows Karen is innocent. Later in the episode Matt knows Karen is keeping secrets from him. Daredevil is still new to the hero game this season, so he'll likely be perfecting the use of his powers (and his fighting skills) as time goes by, but Daredevil has been a human lie-detector for a long time. Meanwhile, prison guard Clyde Farnum meets with the Man who works for We Don't Say His Name. Obviously the latter two get named later, but we're talking about the Kingpin and his right-hand man. The mysterious man shows Farnum live footage of his daughter Tracy Farnum and, in no uncertain terms, threatens to have professional assassin Mr. Rance hurt her in very unpleasant ways. Farnum owes the man's employer almost $29,000, but his debts will be forgiven if he kills Karen Page in lockup and makes it look like suicide. When the attack fails, Matt and Foggy confront a few dirty detectives named in the credits as Detectives Blake and Hoffman. Karen was never charged, so she's released to Matt and Foggy's care. Worried about her safety, Murdock offers to take her home. The Brooklyn Bolts baseball shirt she's wearing is wet, and she admits being more of a Hellions fan (which Foggy isn't). In the real world, the Brooklyn Bolts are a fairly new minor league football team – though sports isn't my strong suit so maybe someone else gets the reference? More on point for Marvel, the Hellions were a team of mutants – not so much evil but under the influence of bad teachers. Outside Matt's living room is a bright, glowing sign advertising Xining Airways, presumably offering flights to the Tibetan Plateau. Who wants to bet this airline shows up in the up-coming Iron Fist show, considering a major plot point involves going to mountains in Asia? Meanwhile, Leland, Vladimir, Anatoly, Nobu, and Madame Gao wait to meet with the Kingpin's man at a United Allied site, though Leland would rather meet somewhere warmer like Per Se, and Nobu doesn't seem affected by the weather. The cabal discusses recent events, like the Russians' concerns about another criminal named Prohaszka, and recent problems with the "Man in the Black" (not-yet Daredevil). Leland notes that whenever superheroes show up, it's the criminal masterminds like themselves who reap the benefits. These players will be addressed in more detail later. Everything in its time. Karen sneaks back to her apartment to retrieve a jump drive with incriminating information on Union Allied, but Rance is there to get the drop on her – thankfully Daredevil shows up. 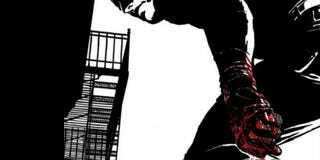 It's interesting that Daredevil's early fights are so intense – comic readers are probably used to seeing DD as one of the top fighters in comics, but this is just Season One Daredevil. Comic book companies love to retell origins. A lot of times these are called "Year One," although DC tends to use that term more than Marvel. Marvel briefly tried "Chapter One," but the inaugural Spider-Man: Chapter One was so poorly perceived that it was dropped. More recently Marvel has been producing Season One comics, retelling various origins. In flashbacks, Matt remembers his dad telling him to study, not fight, but in the present Matt practices in Fogwell's Gym, where his dad used to train. Posters on the walls still advertise his dad's biggest fight, Carl Crusher Creel vs. Batlin' Jack Murdock. In the comics, Creel (later the Absorbing Man, as seen in Agents of SHIELD ) was the last guy Jack fought in the ring before he died, and Daredevil trained in Fogwell's, prominently during the "Born Again" arc. And yes, that is an onomatopoeia representing Matt's boxing glove against the canvas bag, but let's be mature about it as the sound effect was used long before internet memes. There's also a montage of the Kingpin's partners at work, with Leland cooking the books, Gao using purposely blinded workers, Nobu looking over blueprints for a major construction project in Hell's Kitchen, Turk making a weapons deal, and a young boy is kidnapped by the Russians – which Daredevil hears. Now the Man Without Fear will have to step into the ring.